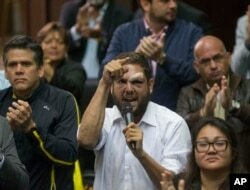 Venezuela's pro-government constitutional assembly stripped two opposition lawmakers of their immunity from prosecution Wednesday, accusing them of having roles in a drone attack that authorities say was an attempt to kill socialist President Nicolas Maduro. The National Constituent Assembly voted unanimously to lift the protection for Julio Borges and Juan Requesens, who have seats in the opposition-controlled legislature. The move came after the Supreme Court ordered the arrest of Borges, who lives in in exile in Colombia's capital, Bogota. Requesens was arrested Tuesday. Maduro has accused the two of being tied to a weekend incident in which two drones exploded while he spoke at an outdoor military celebration. In ordering the arrest of Borges, 48, the Supreme Court accused him of "flagrant crimes,'' including public incitement, treason and attempted homicide. "Several of the declarations indicated Julio Borges. The investigations point to him,'' Maduro said, though he provided no details of Borges' alleged role. FILE - Opposition lawmaker Juan Requesens, center, speaks at the National Assembly during a session in Caracas, Venezuela, April 5, 2017. President Nicolas Maduro on Aug. 7, 2018, accused Requesens and another opposition legislator of having roles in the drone explosions that Venezuelan officials have called an assassination attempt against him. The events came as Venezuela's economy continues to hemorrhage and thousands flee to neighboring nations seeking food and medical care. Maduro has grown increasingly isolated, with the United States and other foreign powers slapping economic sanctions on a growing list of high-ranking Venezuelan officials and criticizing his government for being an autocratic regime.